SAT NAV - REAR PARKING CAMERA - KEYLESS ENTRY & START - PANORAMIC GLASS ROOF - SUEDE LEATHER INTERIOR - BRAND NEW MOT EXPIRY FEBRUARY 2020 - ZERO TAX & 75MPG! 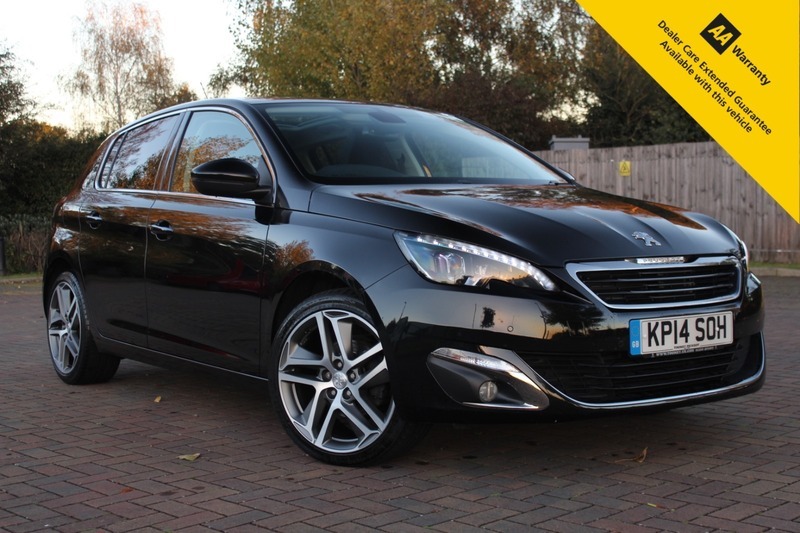 Here for sale at Leigh Cars Ltd we have a super example of the sporty looking Top Specification Peugeot 308 Feline 1.6 e-hdi in a striking metallic black. This particular 2 OWNER FROM NEW example comes with a BRAND NEW MOT EXPIRY FEBRUARY 2020. This vehicle has also had ALL 4 DIAMOND CUT ALLOY WHEELS PROFESSIONALLY REFURBISHED. The Feline specification level comes with some great specification including CLIMATE CONROL, BLUETOOTH, MP3 + USB CONNECTION, REAR PARKING CAMERA, FRONT PARKING AID, SAT NAV, PANORAMIC GLASS ROOF, HALF LEATHER SUEDE ALCANTARA INTERIOR, 18" DIAMOND CUT ALLOY WHEELS, KEYLESS ENTRY & START + much much more. If you are looking for a stylish hatchback with extremely low running costs and bags of space then this is definitely the car for you. This particular engine IS ZERO TO TAX and will return you an ASTONISHING AVERAGE OF 74.83MPG. As we are an AA ACCREDITED DEALER, with any purchase through Leigh Cars Ltd, you will also receive 12 MONTHS FREE AA BREAKDOWN ASSISTANCE. We offer very competitive LOW RATE FINANCE packages with ZERO DEPOSIT - Why not check out our finance calculator on our website where you can tailor a personal quote to yourself and even INSTANTLY APPLY FOR FINANCE! We offer PART EXCHANGE and NATIONWIDE DELIVERY and we also offer HOME APPOINTMENT SERVICE subject to conditions. We are RATED 5 STARS BY OUR CUSTOMER REVIEWS so you can be assured you are dealing with a company you can trust.